Is Professional Service or DIY Your Best Option? Your portable HDD has a problem and you’re researching external hard drive recovery options. In this discussion we’ll examine your options, based on the symptoms. As always, an informed decision is superior to guessing! Firstly, feeling pressure or taking hasty action can be damaging to any data recovery attempt, so try to detach yourself emotionally from the situation (if possible) before any irreversible decisions are made. A clear head could really be considered a prerequisite for data recovery! What symptoms is the drive now exhibiting? Q. What symptoms did the drive exhibit when next connected? My preliminary conclusion: the drive has sustained a physical impact whilst the heads were parked. It was likely operating when you stood up and it was jerked into the air, which is a risk factor. However, the head crash (inferred from the beeping/buzzing sound it’s making) will likely have been caused when the drive landed on the ground and the heads were abruptly bumped from their park ramp and onto the platters. Minor platter damage is possible and I estimate an 80% chance that the heads are still in sufficiently workable condition that I can recover most or all of your data with my equipment. This would be a Category 2 recovery and I should have it completed within 2 to 5 working days, depending on severity of damage and amount of data required. Send the drive in for a free inspection and quote for confirmation of findings and we’ll proceed from there by your direction. My preliminary conclusion: the drive has sustained a physical impact whilst the heads were in play. 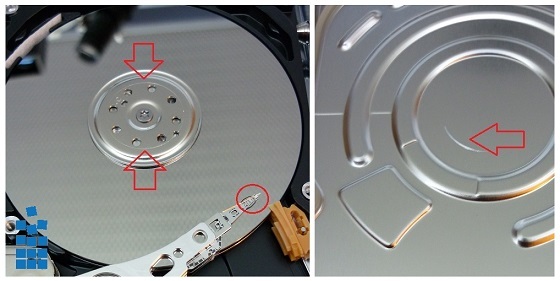 Some platter damage is expected and I estimate a 90% chance that the heads are damaged and will require replacement for data recovery to be possible. This would be a Category 3 recovery and I should have it completed within 20 working days under standard priority, depending on severity of damage and amount of data required. Send the drive in for a free inspection and quote for confirmation of findings and we’ll proceed from there by your direction. SCENARIO 3: External hard drive not powering up; was fine yesterday! My preliminary conclusion: the drive has sustained electronic damage and should be fully repairable for data recovery purposes. Whilst a worst-case scenario could see this being a Cat.3 recovery (if the motor or head assembly has been damaged), in most cases this would be a Category 2 recovery or even a Cat.1 in some cases. Pending difficulty and parts availability, I could have it completed for you within 2 to 5 days and a full recovery is likely. Book the drive in for a free inspection and quote for confirmation of findings and we’ll proceed from there by your direction. There are many variations of the above conversations and I have several of them each week with potential clients. Please feel free to call or email to discuss your own situation, I’d be glad to help you work out what to do if you’re feeling a bit stuck and unsure! You’ll find sympathetic, helpful and expert assistance here, should you decide to get in touch. For professional external hard drive recovery, you can find an estimate of my pricing on my Process and Prices page. As always, I offer a free inspection and quote so you’ll be able to make an informed decision on whether to use my services or possibly to even consider a DIY approach if safe to do so. Whatever you do, try to be deliberate and considered in your actions. If you aren’t confident in any particular course of action, please stop and ask someone! You’ll find friendly and knowledgeable assistance on various web forums and online technical communities such as Whirlpool.net.au and Overclockers.com.au and of course, I’m always here to help if you’d like a professional opinion.